Stepping into the historic wood and brick shopfront, I’m greeted by the glorious smell of freshly baked bread. The Alberta Bakery’s cooling racks are loaded with flaky sausage rolls, gooey cheese buns and sinfully decadent cream cheese frosted cinnamon rolls. I’ve already indulged in an old-fashioned cone at the Vulcan Ice Cream Parlour, but a few takeaway butter tarts are essential. 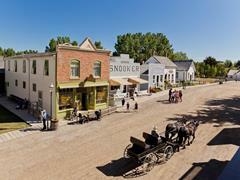 I’m at Heritage Park Historical Village, Canada’s largest living history museum. It’s the best place in Calgary to learn how Western Canada’s pioneers, fur traders and First Nations lived more than a century ago. The park’s costumed interpreters draw you completely into the lives of the people who built the West. I love immersing myself in their stories and experiences and exploring the authentic buildings, tools and artefacts from the era. 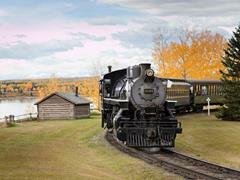 I’m soon in one of the only colonist rail cars in Canada, on a 45-minute historic tour called A Journey West. 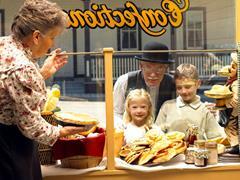 It allows passengers to live as if they’re travelling across the country in the early 1900s. Imagine what it must have been like to cook your own food aboard, asks our guide, conjuring a stew with hard-won vegetables. I plan to board the S.S. Moyie later, a replica of North America’s oldest sternwheeler. It’s a lovely day for a cruise on the Glenmore Reservoir, and I’ve heard the Canadian Rockies views are fabulous. There’s also an electric streetcar system here, representing the almost 80 cars that ran in Calgary between 1909 and 1950. After my journey west, I visit the Famous 5 Interpretive Centre, a replica of Canadian women’s rights advocate Nellie McClung’s Calgary home. She joined four other women and petitioned for the word “person” under the British North American Act to include women. Thankfully she won that right. Moving through the house, we can smell the wood burning in the fireplace. It’s a cosy reminder of the days before you could just flip a switch for warmth. Our costumed interpreter leads us into the sunroom to show off the ceiling of blue glass with tiny dots of light. They represent the stars that McClung used to watch at night. I’m learning a ton of fascinating stuff that I never knew about Canadian women in history. Before leaving the park, I stopped at Gasoline Alley Museum. There are vintage cars, antique petrol pumps and automobile memorabilia here from the 30s, 40s and 50s. Entering the drive-in cinema display, featuring a 1951 Chevy convertible, sparks a long-forgotten memory. I slid onto the seat and could almost hear the crunch of gravel beneath the wheels in car parks long gone. I could easily spend another day exploring the park’s more than 200 exhibits. Good thing I purchased a two-day pass. Tomorrow I’m heading straight for the Ferris wheel at the antique fairground – with a quick detour to the Alberta Bakery, of course.